A kill chain lists the critical links of an attack; if any 'link' in the chain is broken, the attack fails. 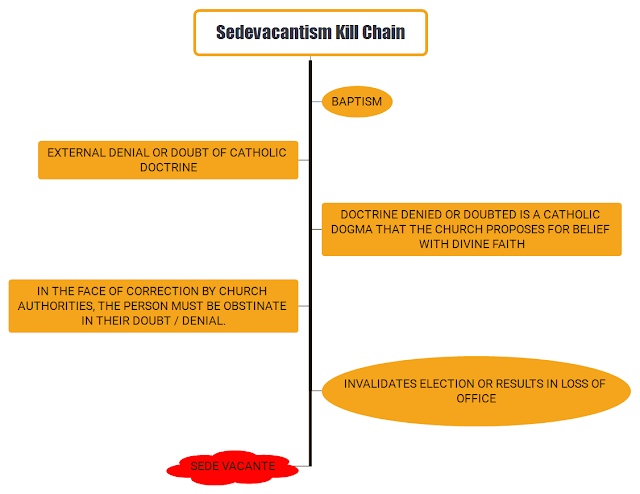 The kill chain for 'sedevacantism' is no different as it describes a chain of events (causes) that must have occurred in order to rationally and objectively conclude that a specific Pope was either invalidly elected or has been deprived of the office of the Vicar of Christ (effect). Without an unbroken chain of causes, the conclusion of Sede Vacante is rendered false. [Note from Salza/Siscoe: As we explained in our article on Fact and Law, the causes (facts), such as the heretical doctrine (material cause) and pertinacity (formal cause) would have to be established by the competent ecclesiastical authority, before the effect (loss of office) would occur. As long as the Church tolerates a heretical Pope (i.e., before the causes/facts have been established), he remains a true Pope, as Fr. Laymann, S.J. explained here. We should also note that because it is technically Christ who deposes an heretical Pope (by severing the bond that unites the man to the office), the crime of heresy (matter and form), even after being established and declared by the Church, is only the dispositive cause for the loss of office (it disposes the Pope for the loss of office). Christ himself is the efficient cause who acts by severing the bond uniting him to the office. One common sedevacantist fallacy is to ignore the Kill Chain completely by placing the effect before the cause. Typically it manifests itself as a strong belief concerning the documents of the Second Vatican Council as being formally heretical. Therefore the sedevacantist concludes that the Popes who convened / closed the Council (John XXIII, Paul VI), and accepted it (John Paul I, John Paul II, Benedict XVI, Francis) could not possibly be valid Vicars of Christ. When they encounter a Church Doctrine that contradicts their conclusion (i.e., that the recent Popes have not been true Popes), they re-imagine it to suit their belief instead of submitting to the Church Doctrine and admitting that their understanding is flawed. The doctrine that the sedevacantists re-imagine is the doctrine of Dogmatic Facts. According to Dr. Ludwig Ott, dogmatic facts are historical facts, that while not revealed are “intrinsically connected with revealed truth, for example the legality of a Pope or a General Council”. In short, there is no confusion about the legitimacy of a the election of a specific Vicar of Christ as the Church has provided us with an infallible means of “knowing”who was validly elected. 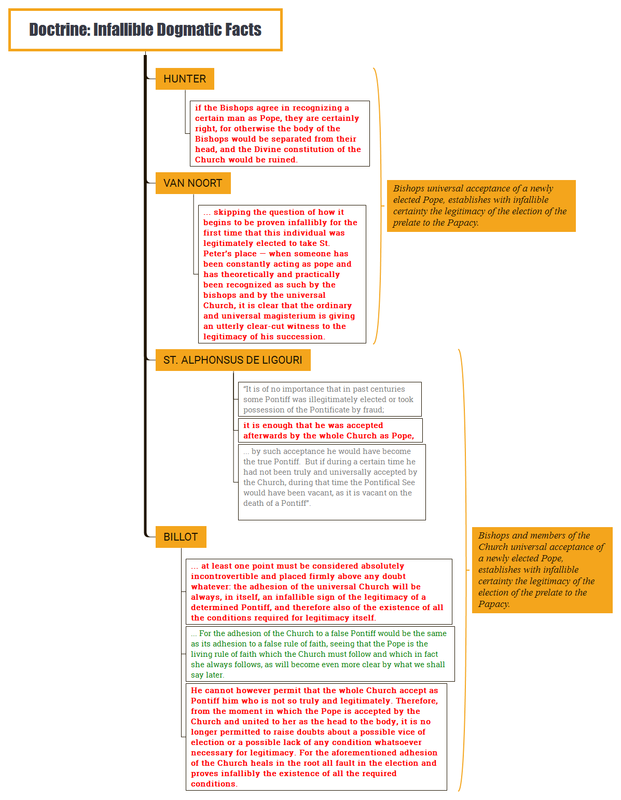 The following diagram outlines four commentaries on the manner of how the infallible dogmatic fact of the legitimacy of a Pontiff's election is established. Following the reasoning of Hunter and Van Noort, all that is required is to establish infallibly that a Pope's election was valid was the acceptance by the Bishops in union with Rome. Van Noort's explanation is further linked to the Ordinary and Universal Magisterium, which is likewise infallible. St. Aphonsus and Billot include with the acceptance of the Bishops (Ecclesia Docens) that of the other members of the Church, presumably including the laity (Ecclesia Discens). The sedevacantists that I have debated ignore Hunter, Van Noort and St. Alphonsus and exclude portions of Billot's thesis by focusing on the section highlighted in Green. The claim made is that no Catholics hold the post conciliar Popes as 'rules of faith' therefore they aren't Pope. One thing is certain, that there was no question of the legitimacy of the election of Pope John XXIII and Paul VI at the time of their election. They were accepted completely by even those who would later assert that the See of Peter was vacant. With respect to the successors of Pope Paul VI, we can also have equal certainty as firstly all subsequent Pontiffs have been universally accepted by the Bishops of the Catholic Church (Hunter and Van Noort). We can also have moral certainty following St. Alphonsus and Billot as there existed a morally unanimous acceptance of the successors of Pope Paul VI as validly elected Popes by the Faithful as well as the Bishops. In the name of intellectual honest, sedevacantists need to either accept or reject the Doctrine of Dogmatic Facts instead of re-imagining it to suit their beliefs. Otherwise, they are simply imitating the modernists whom they profess to expose. 1.) We should note that because the loss of office is caused by God, it would not truly be an "effect" of heresy. Heresy, even after being established and/or declared by the Church, would only be the dispositive cause for the loss of office (it would dispose the Pope for the loss of office). Christ himself is the efficient cause, Who severs the bond uniting the man to the Papacy. What if even one bishop or a bunch reject the newly elected claimant and they don't get publicity , how would the laity keep track of this? Essentially how much acceptance is enough acceptance?